This tutorial focuses on using the Model Panel and handling ensembles of structures (such as those determined by NMR). NMR solution structures of δ-conotoxin EVIA from Conus ermineus that selectively acts on vertebrate neuronal Na+ channels. Volpon L, Lamthanh H, Barbier J, Gilles N, Molgó J, Ménez A, Lancelin JM. J Biol Chem. 2004 May 14;279(20):21356-66. A splash screen will appear, to be replaced in a few seconds by the main Chimera graphics window or Rapid Access interface (it does not matter which, the following instructions will work with either). If you like, resize the Chimera window by dragging its lower right corner. Show the Command Line by choosing Tools... General Controls... Command Line from the menu. If you do not have internet connectivity, you can download the files 1g1p.pdb.gz and 1g1z.pdb.gz into your working directory and then open them in that order as local files (with File... Open). It is not necessary to uncompress the files. This may or may not change the appearance, depending on your preference settings. The Model Panel lists models on the left and functions on the right. A file of coordinates opened in Chimera becomes a model with an associated ID number and model color. Some PDB files are further subdivided into multiple structures designated with MODEL and ENDMDL records; these are assigned submodel numbers. Since each structure can be handled independently, the general term “model” can refer to a submodel as well as a model that is not subdivided. Repeat the process for the other model. 1g1p (trans-proline conformations, white) has been opened as models 0.1–0.18 and 1g1z (cis-proline conformations, magenta) as models 1.1–1.18. By default, the list of functions on the right side of the Model Panel includes only those classified as favorites. If you do not see some function that is mentioned, try changing from favorites to all functions using the checkbutton below the list. When atoms might be needed later, hide should be used instead of delete. Note the orange coloring is gone; interactive presets reset the coloring, whereas publication presets do not adjust colors, aside from making the background white. This command assigns values of the residue attribute named isStrand. In this case, it is not necessary to set isStrand (or isHelix) to false for any residues, since the original strand residues are still in strands and none of the new strand residues were in α-helices. Secondary structure assignments can also be changed by selecting residues and using the Selection Inspector. 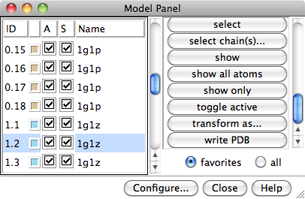 In the Model Panel, the S (Shown) checkboxes toggle model display without changing the display settings of individual atoms, bonds, and ribbon segments. 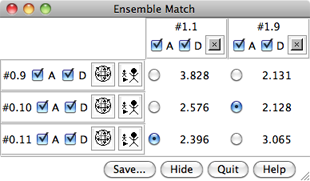 We will use Ensemble Cluster to cluster each ensemble and identify representative structures, then Ensemble Match to compare the representatives. This command deletes models with ID number 0 and model display turned off. Click OK to calculate the matches. Results are shown as a 3 x 2 (or 2 x 3) table with entries for all pairwise comparisons between the ensembles. The A and D buttons control model activation for motion and model display, respectively. The numbers in the table are pairwise RMSDs using the atoms that were specified as Parts to Match. The structures are not yet superimposed. Clicking a button next to an RMSD value performs the corresponding match and reports in the status line the number of atom pairs used. Superimpose each cis-proline conformation in model 1 on the most similar (lowest-RMSD) trans-proline conformation in model 0. When finished viewing the structures, choose File... Quit from the menu to exit from Chimera.